Having fun in the sun... with new fixes! 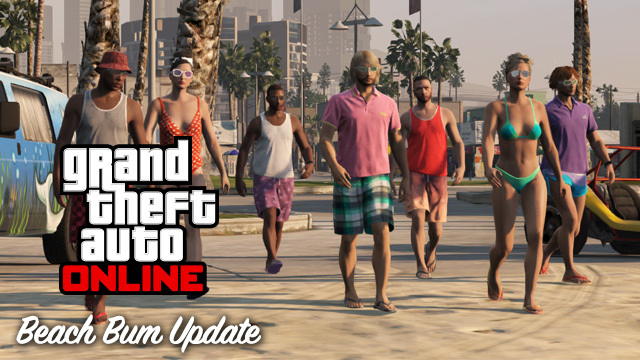 In case anyone was wondering, the latest Grand Theft Auto V patch for GTA Online, Update 1.06, was released this week on the Xbox 360 and PlayStation 3. With it came many in-game fixes and tons of beach-themed activities/items, just in time for the winter season! Fixed an issue where the game would delete your personal Vehicle if you have another player in it when you add a Tracker and Insurance. Fixed an issue where players could become stuck on the aerial view when entering GTA Online with cloud servers down and having just launched a mini-game. Fixed an issue where the mission 'Damaged Goods' would start even though it had previously been completed. Fixed an issue where under rare circumstances players couldn't claim back their personal vehicle in GTA Online. Fixed an issue where under rare circumstances players were able to get the Declasse Sheriff SUV into Los Santos Customs and respray it causing the menus to malfunction. Fixed an issue where in rare circumstances players would lose all personal vehicles after being idle kicked and unable to rejoin an online session. Fixed an issue where players could occasionally get stuck after killing a pedestrian with a golf ball. Corrected an exploit where players would retain their personal vehicle after selling it at Los Santos Customs mod shop by transitioning back and forth between Story Mode and Online. Corrected an exploit where players could keep repeatedly selling a Bati 801 to Los Santos Customs. Corrected an exploit where players were able to duplicate vehicles by accepting a Mission while leaving a high-end garage. Corrected an exploit where a player could start a Team Deathmatch with all players on the same team. Players are no longer able to delete their GTA Online character while the Rockstar cloud servers are unavailable. The Bad Sport penalty for destroying personal vehicles has been reduced significantly. Players will no longer receive a Bad Sport penalty when they are in a non-moving tank and other players crash a vehicle into them. 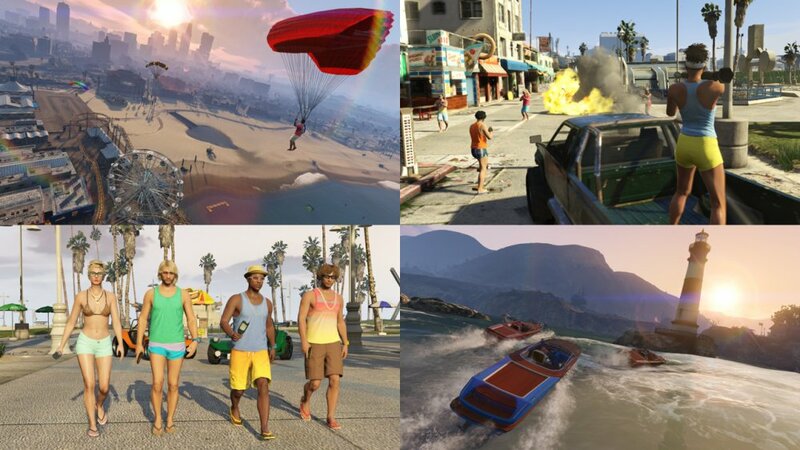 The GTA$ and RP rewards for Races, Deathmatches and Parachuting are now based on the average time they take to complete. Players now receive GTA$ and RP rewards when failing a cooperative Job or being a member of the losing team during a Versus Mission, depending on how long the Job / Mission lasts. Players now receive a bonus GTA$ multiplier for Missions when played at the higher difficulty levels (Normal = 1.25, Hard = 1.5). In Team Deathmatch, all players on a team now receive the same GTA$ and RP rewards, with the winning team getting roughly 4-5x what the losing team receives. Removed some instances of debris in specific Races, including the cardboard from the 'Down the Drain' Race. Deliveries from Pegasus have been reduced from $1,000 to $200. The cost of removing a wanted level by calling Lester has now been scaled based on the amount of stars you have - at a cost of $200 per star. Restricted cars and vehicles that have been added to player garages through exploits have been removed. This includes tanks, helicopters and police vehicles. The following vehicles have been added to the southernsanandreassuperautos.com website in-game: BF Dune Buggy, Canis Bodhi, Karin Rebel, Maibatsu Sanchez 2, Vapid Sadler, Vapid Sandking SWB. To eliminate any remaining vehicle loss issues, an additional automatic cloud save will occur when purchasing a vehicle or vehicle modification. Update 1.06 is completely free, so it’s a great reason to log back into GTA Online for a game session or two (if you’ve take a break from GTA V). We’re still waiting on the heist jobs to hit, but we have no problem exploring what Beach Bum has to offer right now. Page created in 0.3969 seconds.